Karl Rove’s dark-money nonprofit Crossroads GPS has entered the Massachusetts Senate fight between Democrat Elizabeth Warren and incumbent Republican Scott Brown with robocalls attacking Warren. The state’s Democratic Party obtained audio (below) of one of the calls, which hits Warren for supporting Obamacare, misleadingly claiming that the program “will cut over $700 billion from Medicare spending.” Another call criticizes the work Warren did as head of the watchdog panel overseeing the federal government’s bank bailouts. $1.5 million: Billionaire philanthropist George Soros has committed $1.5 million to liberal super-PACs—$1 million to the pro-Obama Priorities USA Action and $500,000 total to two groups focused on congressional races. Previously, the right’s favorite big-money bogeyman gave $1 million to the American Bridge super-PAC, $175,000 to House Majority PAC, and $75,000 to Majority PAC. After his previous donations, Soros had hinted that he might not give to Priorities. 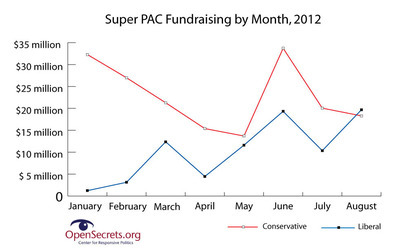 In August, for the first time this year, liberal super-PACs outraised their conservative counterparts. Liberal super-PACs took in $19.7 million compared to conservative super-PACs’ $18.3 million. 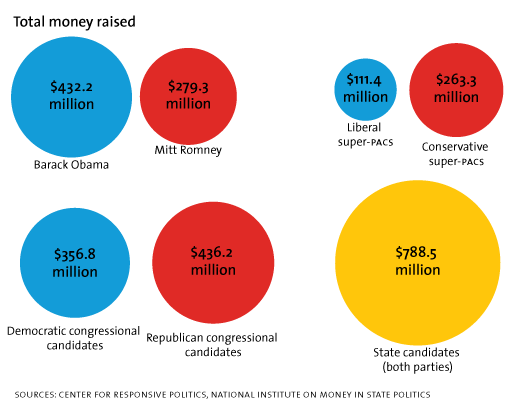 All told, super-PACs have raised $390.6 million during the 2012 election cycle. • David Corn’s Reddit AMA: The Full Questions and Answers: MoJo‘s DC bureau chief, who broke the Mitt Romney donor-video story, met the ‘net Friday afternoon.